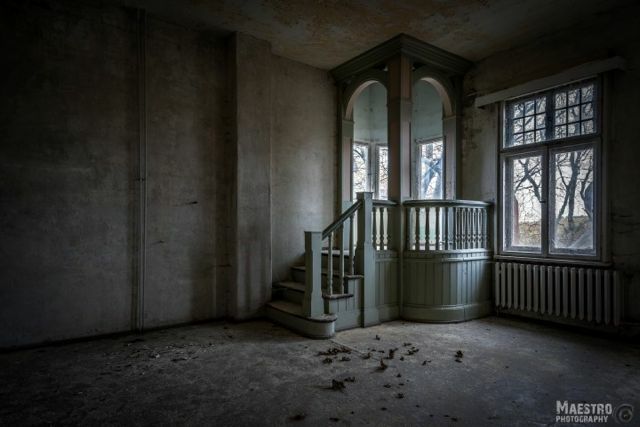 Bas van der Poel is a Dutch photographer who’s passionate about urban exploration, a hobby and type of photography that takes dedication and courage. 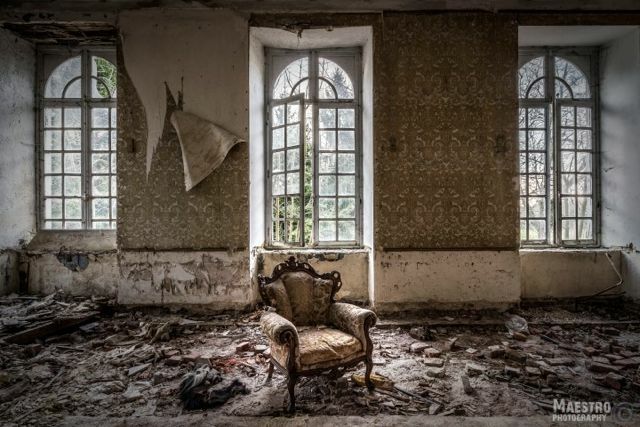 Urban exploration means entering neglected buildings, usually off-limits and hidden from the public, in order to capture the beauty of natural decay before the buildings are trashed, demolished or renovated. 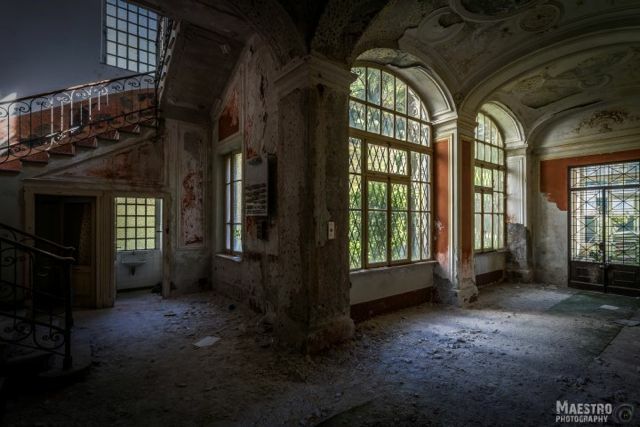 Bas has explored a variety of deserted buildings, including factories, hospitals and churches, but his most striking photos show the decay of abandoned châteaus and mansions. These monuments to idle grandeur are haunting, with so much beauty contrasted against emptiness. This castle was built somewhere in the 17th Century. 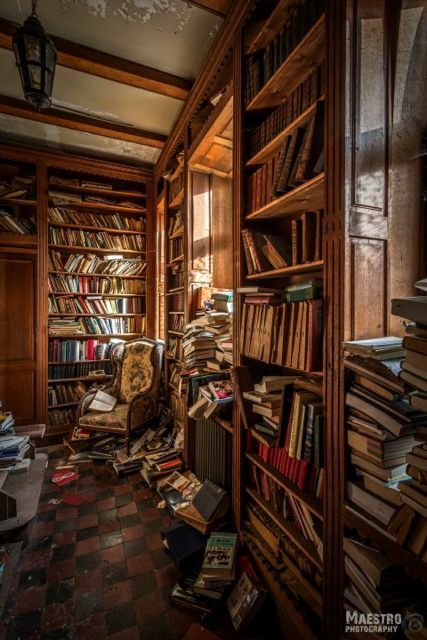 Must have been left abandoned for a lot of years. Some parts of the roof already collapsed. 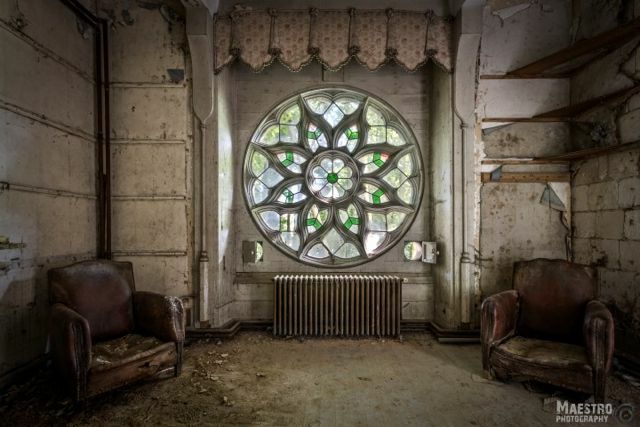 The weirdest thing is that almost all the windows are intact. 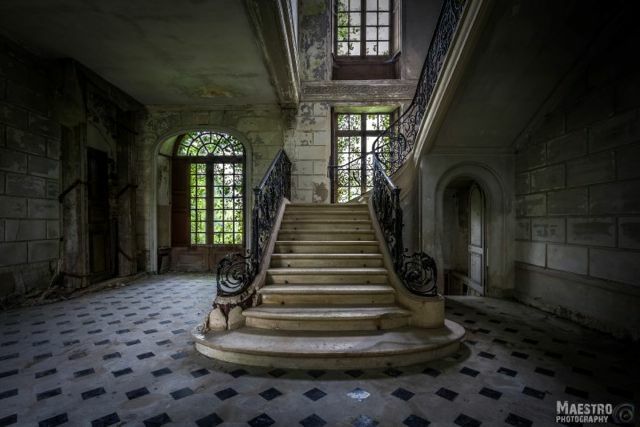 A wonderful place with an amazing staircase. Somewhere in Germany lies this amazing castle. Dates from the late Middle Ages and destroyed in a fire around 1500. After it was rebuilt, over the years it transformed several times and changed owner a lot of times. Because of insolvency the castle was foreclosed in 2004. Nowadays the castle is abandoned. This villa was owned by a very wealthy family that is deeply rooted in the city. When the wife died, the rest of the family fought over the inheritance. 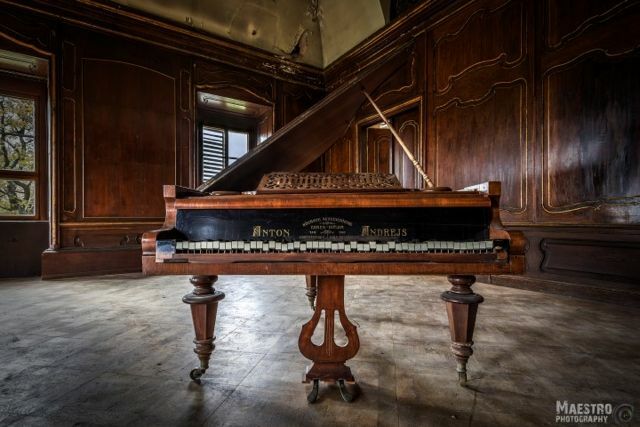 A few years later, a real estate investor bought villa Beethoven. 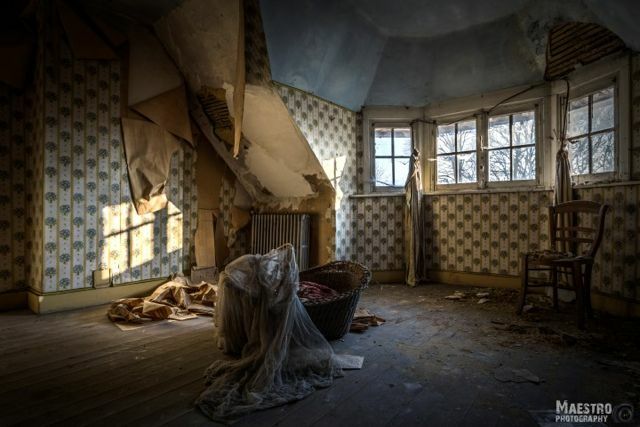 The plan to renovate it failed. Found this castle a few years ago. At that time it was still inhabited. 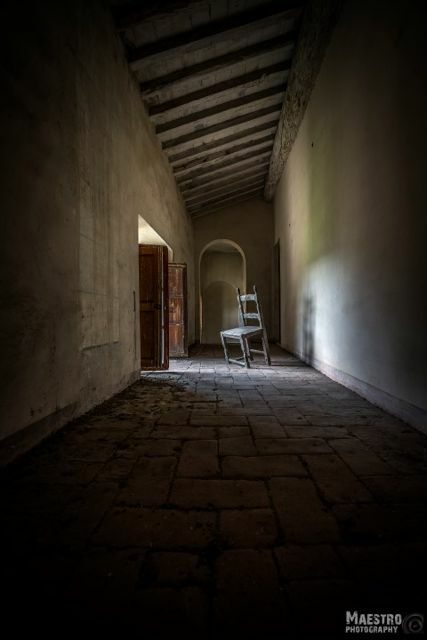 After it was abandoned, the castle was sealed for a long time. Until we got a tip. There was a way in… The castle was originally built in the 13th century. Midway in the 15th century, the castle was destroyed and rebuilt. The castle is severely decayed nowadays. But there are so many wonderful details. Finally had the chance to visit this beauty. The castle was built at the end of the 14th century to guard the French against the English. In 1412 it was taken by Philip of Burgundy and the castle was set on fire. It was restored later on by the English and used to house very important British aristocrats. It was rebuilt in the 19th century after it had been destroyed. The current owner has no hurry restoring the place, and that is what the community would like to see the most. 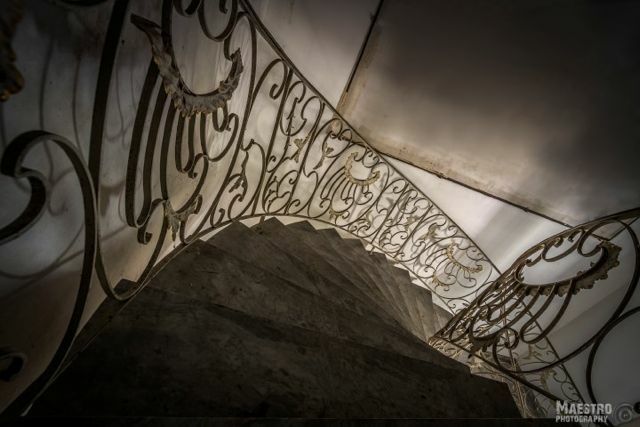 This beautiful piece of French heritage should get the chance to have a second life. Or a 3rd or a 4th…. Unfortunately, 3 weeks after we visited, the place was burned down to the ground. Hard to believe that maybe we were the last visitors before it was destroyed completely. A villa with lots of kitschy rooms. From the outside the place looks like a big gray box. But the inside surprised us a lot. We couldn’t find any info about the history of this place. Maison de Viron was build in 1925, commissioned by the Baroness de Viron. The baroness still lives in the house next to it. For how long this building has been abandoned, I don’t know. But by the look at it, it has been a long time. Palazzo di L. dei Conti M.
Nature is really taking over as the plants are entering the large building on the ground floor already. Since the trees are really growing inside, you have the feeling that you are surrounded by dense forest. It was a hot sunny day. We parked our car and arrived at a larger type of farm. Italian style! But not very impressive on the outside. We walked through thorn bushes up to 2 meters in height, in the blazing sun, but could not find a way in. After some more checks we finally found our way in. 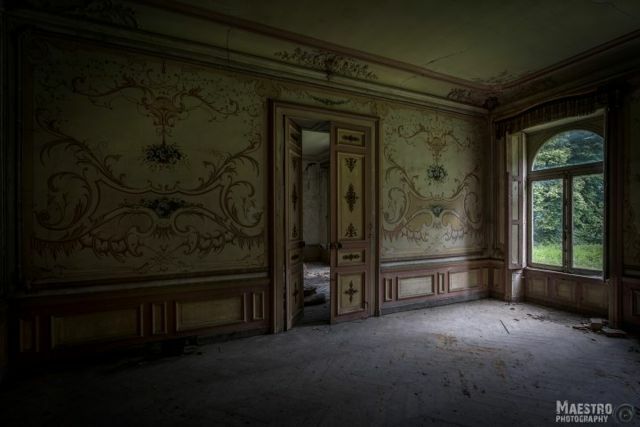 At first, I was still not impressed with what I saw: empty rooms with… Nothing. Until we found the rooms we were looking for. Two rooms inside are beautifully decorated with frescos, something you would not expect in a farmhouse. We got what we were looking for! 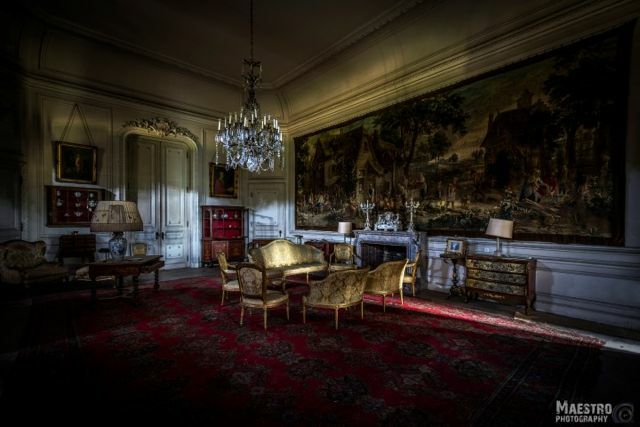 Built in early 18th century, this castle is way beyond its glory days. With a driveway in the shape of a wine glass. it used to be a wonderful place. Unfortunately we were just a few weeks too late… They removed all the furniture. 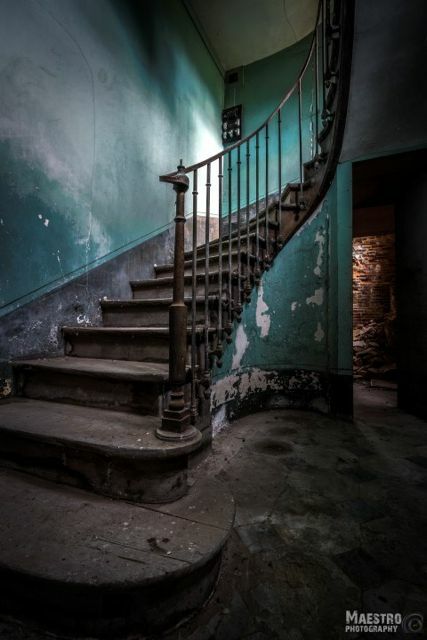 🙁 But still a wonderful location with an awesome staircase. 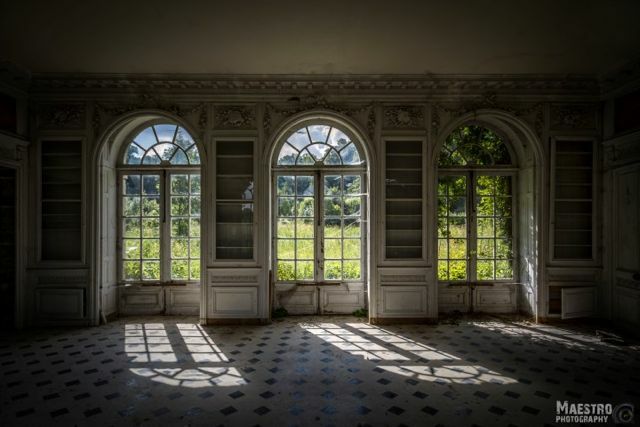 This castle hidden in a sleepy town in France was built somewhere around 1830 by a wealthy family. They still own the castle. The castle is in a very bad state…. In some places, the roof has collapsed. And the floors aren’t that good either. Although it’s empty, it was still worth a visit. This one was on my list for a long time… Finally we had the right info to get in. Built somewhere in the 19th century at the request of a Marquis, the castle is still in the royal’s hands. 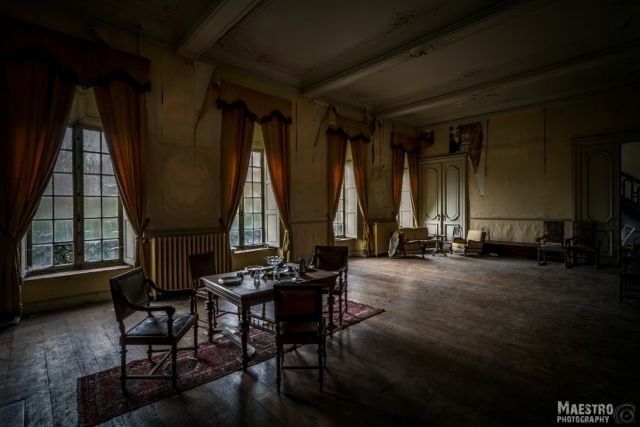 The story goes that the current owners cannot agree on the heritage, and therefore the place is left without being cared of. In 1616, a small monastery was built on this place. What happened to it, I don’t know. But at the very beginning of the 19th century, this beautiful castle was built. 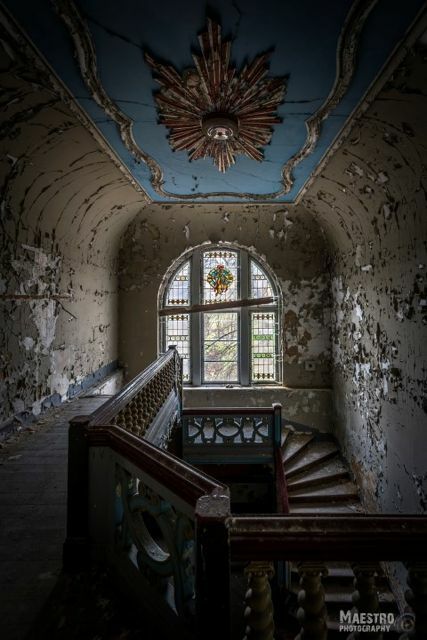 When the 20th century started, the castle was converted into a rest home. We had some wonderful light inside because of the sunset that day. For how long this place has been abandoned, I don’t know. Whitewashed brick building in neoclassical style, dating mainly from the 19th century, this castle was owned by numerous barons. The front of the castle was built around 1820. Over time, the castle underwent numerous restorations and transformations. 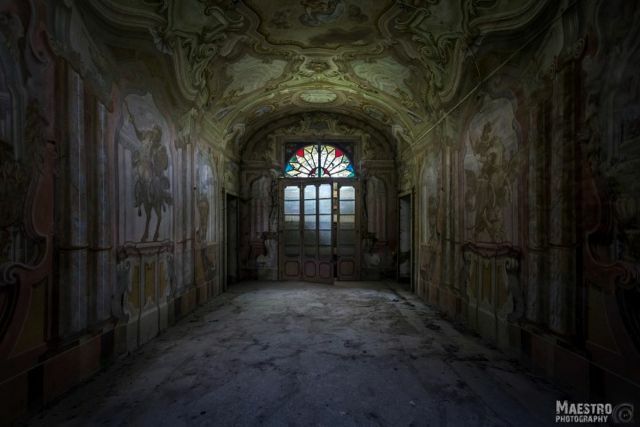 It now has whimsical architecture, which gives it an original and even a little disturbing atmosphere in foggy weather. It is possible that the castle was built on the site of an ancient Roman villa. To see more of Bas’s photography, visit his website, Facebook page, or Flickr photostream. 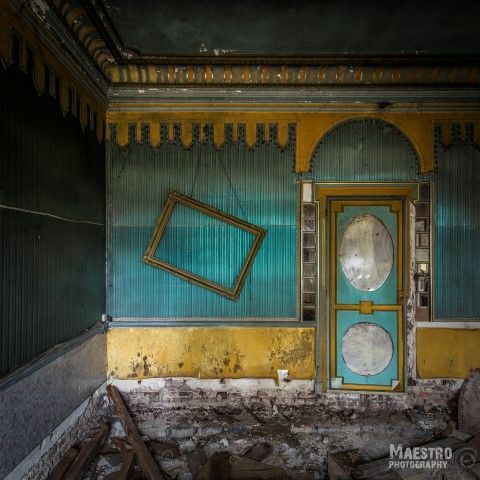 2 Comments on "Haunting Photos of Abandoned Châteaus by Bas van der Poel"
I love these images by Bas van der Poel. 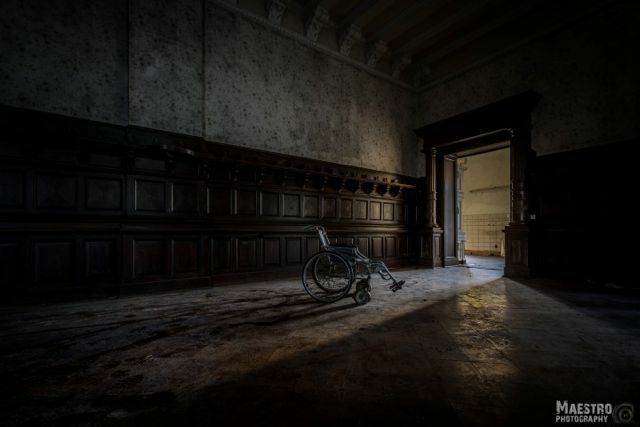 House of Wheelchairs and Chateau Congo are my favorites. Thanks for sharing. 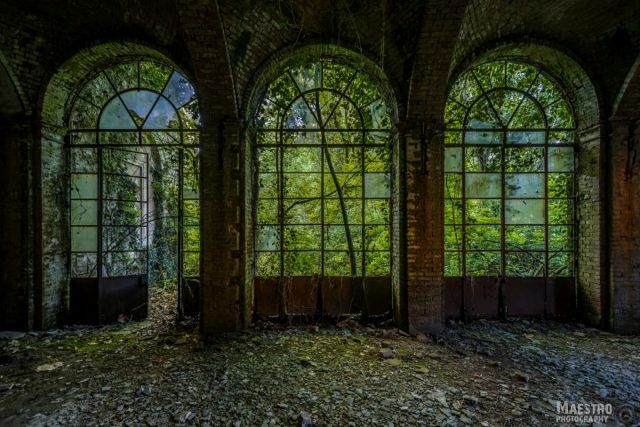 These photographs are great inspiration for me, as I also love photographing abandoned locations. Very impressive photographs! The descriptions are explicit. Hard work put in should be appreciated.Each photograph takes the viewer’s imagination to the peak period of the building’s glory.